STEP aside, yoga and pilates. There are new kids on the block ushering in a new revolutionary wave; taking apart tried-and-true forms of exercise and injecting a dose of innovative techniques to enhance the whole getting fit experience and making it much more fun. From hot pilates to TRX and aerial yoga, there is something for people from all walks of life — dancers, marathon runners, long-time yoga freaks and the average working adult are bound to find something interesting to pump their muscles up without having to pay for exorbitant gym fees. Flyoga is a low-impact take on traditional yoga, practised with the use of a fabric hammock to help strengthen muscles and to enhance stretching activities. The best part is that Flyoga is open to everyone, even people who’ve never done any sort of yoga before. It is designed to instil a sense of coordination as well as concentration into participants — instead of having to push yourself to the limits of physical poses as in traditional yoga, the hammock helps ease you into these poses by providing support. Flyoga increases core strength, muscular flexibility, joint mobility, mental concentration and overall body alignment. Its weight-bearing hammocks also mean that those who suffer from joint or balance problems can overcome these weaknesses and still enjoy yoga in a non-traditional way. The hammock suspends and supports body weight, making it low impact, hence decreasing the possibility of joint injuries — similar to swimming activities that are recommended for those with bone and joint problems or surgeries. Flyoga classes are three-tiered — levels one through three depending on experience and 60 minute classes are RM50 for members and RM60 for non-members, 90 minute classes are RM80 for members and RM100 for non-members, and a 60 minute private yoga class is RM250. There are also package deals available. Flyoga classes are brought to you by Viva Vertical and conducted at Dreams Dance studio at their branches at Asian Heritage Row, Kuala Lumpur, Bandar Sri Damansara, Desa Sri Hartamas and Subang Jaya. For information, visit www.vivavertical.my/flyoga or email [email protected]. 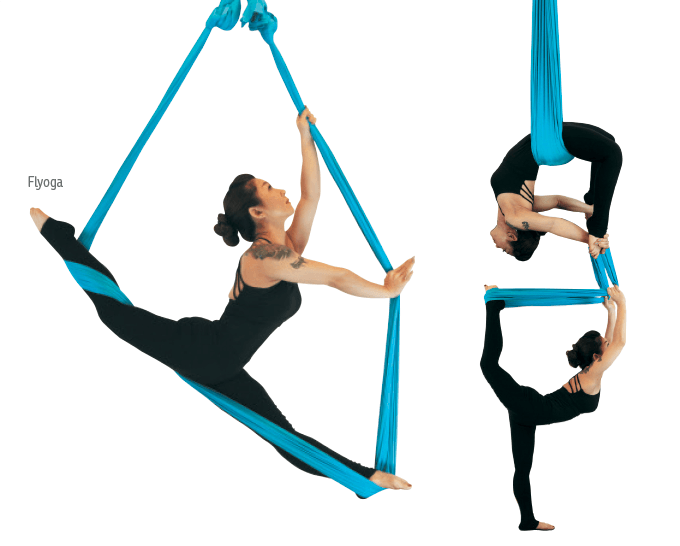 Similar to Flyoga, Aerial Dance makes use of silk fabric sheets or hoops to help performers balance, strike poses and make flexible turns. Two forms called Aerial Hoop Dance and Aerial Silk Dance focus on spinning, acrobatic moves, and on toning up the various muscles in the body. Motor skills such as balance, coordination and flexibility are focused upon while being suspended in the air. Both forms of dance are available at various levels, and people with no prior dance experience are all welcome to participate. Aerial passes for 60 minutes are RM70 for members and RM100 for non-members. Package deals are also available. Classes are held at Dream Dance studios at Asian Heritage Row Kuala Lumpur, Bandar Sri Damansara, Bangsar and Subang Jaya. For schedules and information, visit www.vivavertical.my or email [email protected]. While doing pilates in 38°C to 40°C might sound daunting, it’s actually been shown to help warm up muscles, allowing for a deeper stretch and help detoxify the body through the release of toxins in sweat. Hot pilates burns fat, encourages weight loss, improves sleep, blood circulation and helps combat health conditions such as depression, lower back pain and arthritis. Hot Pilates at Urban Spring offers classes for all fitness levels — there are classes for beginners all the way up to advanced pilates practitioners. For scheduling information, visit http://www.urban-spring.com. There are classes conducted every day of the week; most of the time several classes a day. They also offer private personalised pilates classes with a dedicated, certified trainer. Urban Spring is located at 57-1 Jalan Bangkung, Bukit Bandaraya, Bangsar. For inquiries, call (03) 2095 3998. Every now and then, a new fitness craze hits home and this time, it’s TRX. A form of suspension training which uses participants’ own body weight to create different resistances. TRX trains participants to develop strength, agility and balance. It was originally conceived by a former US Navy Seal, albeit catered to the masses and modified to become more fun. TRX is a slightly higher level of fitness activity, so those with weak cores and poor stability should start with other strengthening courses such as pilates to create strength in the pelvis, trunk and shoulder girdle. It is imperative that those wanting to try out TRX be on good form so that the risk of injury is minimised. Known for being rather demanding physically, TRX is perfect for those wanting a tougher challenge to include into their exercise regime. TRX classes are available at Urban Spring, taught by certified TRX trainers at 57-1 Jalan Bangkung, Bukit Bandaraya, Bangsar. For inquiries, call (03) 2095 3998.